The Savvy Stamper: Stash the Booty! 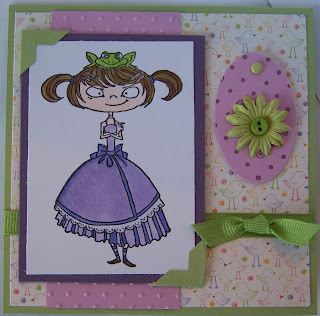 I couldn't resist doing the challenge for Kraftin Kimmie Stamps this week. It's Challenge #17 - stash the booty! Basically, create a card with a hidden element, and I have to say it was really neat to do. Picture one is closed, and picture 2 is with the tag open. I just used a brad to put 2 oval punchouts together. Image is Kraftin Kimmie's Lillith, colored in with Copic and Bic Mark It Markers. DP is DCWV, SU Certainly Celery, Mauve Mist and Perfect Plum. Photo corners are from a Martha Stewart punch. This is AWESOME!!! I love her images. Ha ha ha!!!! I love that image!!!! What a cute little card - love the hidden sentiment! OHHHHHHHHHH! So sweet, Colleen! 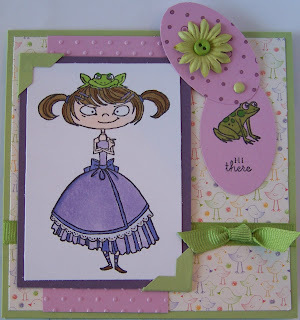 I LOVE the swinging door there with the froggie underneath! Great job and thanks for joining us for this week's Kraftin' Kimmie challenge!! Funniest image I've seen in a while! She's so cute and I love that little tag! What a fun card! That tag is too cute and the designer paper is adorable! Nice coloring too! OMgoodness...I just love this...how cute!